with a Jazz Goa app for both IOS and Android devices. Spearheading the Jazz Goa organisation in Goa by encouraging local talent to keep jazz alive in Goa, over the years, Colin has helped artistes record both, audio and video, free of cost at the Jazz Goa’s studio in Sangolda. Jazz Goa is the only organisation in India that has hosted International Jazz Day right from its inception by the UNESCO in 2011. “Nowadays, no one listens to CDs and if your music is not on an app, your music will not be heard. It’s rare for people to download a song and listen to it if the artistes are unknown. I realised this when I was on a visit to Canada and music was being streamed liveeverywhere. If you don’t have an app, your music will be lost as there are millions of songs being uploaded every day. Through the app, music will be streamed 24/7; if it is copyright free, it will be available for download. Every week, new songs by different artistes will be uploaded,” informs Colin, who produced the album, ‘Chartbusters from Goa’, a compilation of hits by various Goan singers. 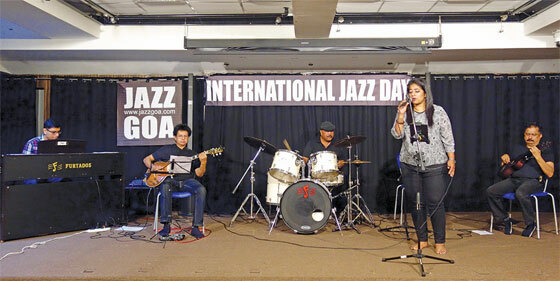 Jazz Goa has recorded over 200 originals featuring close to a hundred local artistes. Many of these tracks topped international internet charts. The app will be launched on the September 30, 2018 and will initially launch with twelve different genres of jazz. The genres include Jazz standards, vocal jazz, smooth jazz, Latin jazz, Indo-jazz fusion, Indo-jazz lounge, Konkani jazz, Bollywood jazz, Jazz bossnova, Jazz saxophone, Gypsy jazz and smooth jazz fusion. “We will be updating the app with all other genres of music being created by Goans locally and around the world. Almost all original music will be available on a single app. We will also be adding Konkani classic songs as the emphasis will be on original music. The app will also have eight radio channels streaming half an hour of music,” adds Colin. The app is being developed by Delhi based international app developers, ‘Yukti Solutions’ and they are now giving it a few final tweaks before the big global launch. It will be available as a free download across several distribution channels on the internet. “The developers are high end and they didn’t have a music app on their portfolio, making Jazz Goa app their first music app. I have control over all the data that goes into the app and I can monitor this on the control panel. Almost all the songs that have been recorded will be uploaded on the app, however, equal importance will be given to the quality of the work. With the full world gaining access to the music, there has to be good quality that puts us on the map,” says Colin. The jazz community is abuzz with excitement about the app and are eagerly awaiting the launch of the app. “Amongst ourselves, we know about the jazz musicians in Goa but through the app, more artistes will get exposure for their songs and original compositions. There is no limit to the audience and every artiste will get recognition as their name will be featured with the track,” concludes Colin.